Many assume that the styles modern and rustic go against each other. Each of these design styles have its advantages and disadvantages, and can suit different types of residents. However, there’s no need to choose one or the other if you’ve fallen in love with both the streamlined modern aesthetic and the homey charm of rustic homes. Yes, you can get the best of both worlds. 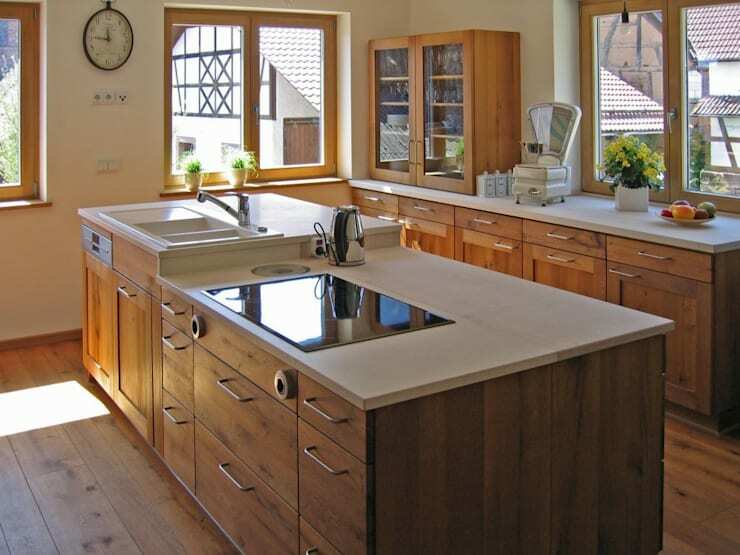 In this ideabook, we offer 10 rustic kitchens that professional architects were able to modernize with great success. Get inspired to create your own dream kitchen with elements from two different styles! Oak is arguably one of the most popular types of wood when it comes to creating rustic kitchens. If you’d rather not go with oak, walnut, beech and mahogany are also commonly used. For those who find natural wood too expensive or high-maintenance, laminates and other materials that look like wood are good alternatives. 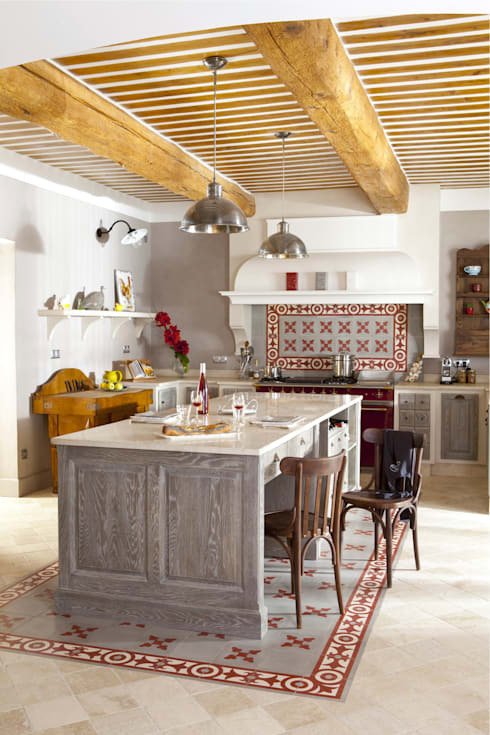 In this kitchen, the hue of the natural wooden beams contrast beautifully with the pearl gray of the island and tiles. Different types of chairs with similar colors also add a delightfully unrefined touch to the space. To keep the kitchen modern, industrial elements like the metal light fixtures are fitted throughout the room. If you prefer classic-looking wood, here is a rustic kitchen of the style that features a more traditional and subdued design. The darker color of the wood creates a warm and inviting atmosphere. To keep the kitchen from being too somber, the designer used light-hued tiles for the splashbacks and flooring. 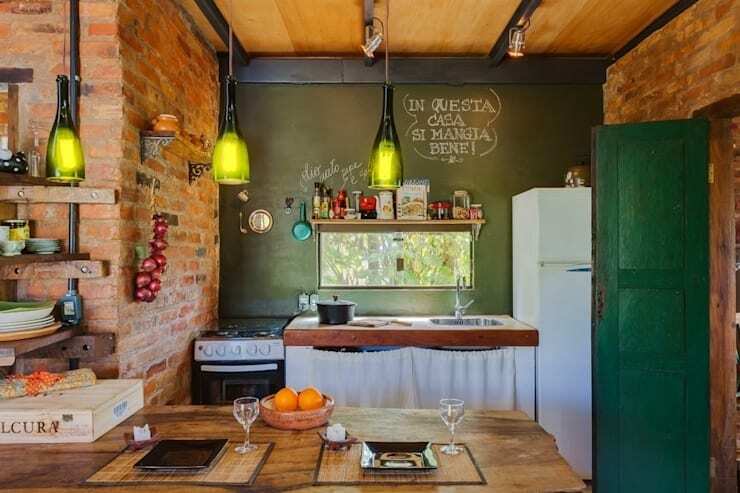 Other little decorative details add to the rustic charm: floral carvings on the wood, a basket on the top shelf and wooden cooking equipment within easy reach. 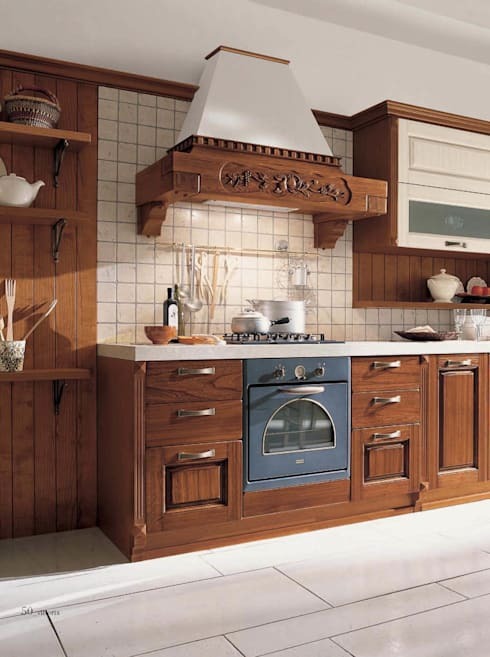 Injecting a contemporary pop to this traditional kitchen is the blue oven door, which also creates a beautiful balance of colors. This additional detail is an original way to visually bring the entire space together without adding too many decorative elements. 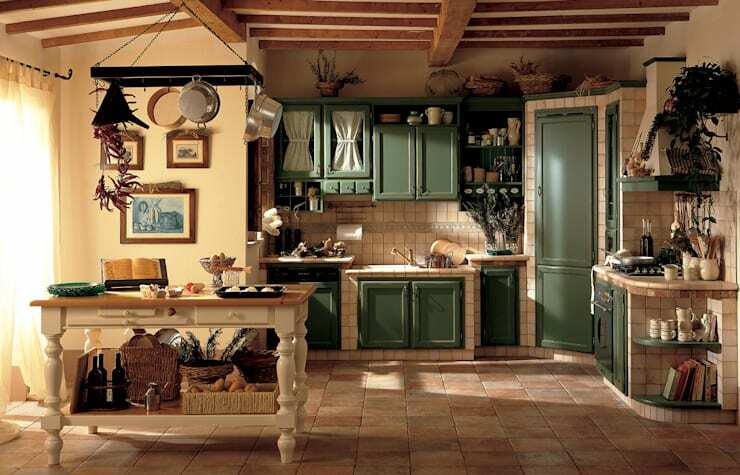 This spectacular rustic kitchen exudes the undeniable charm of southern France with combination of warmth of neutral backdrops and olive green doors and cupboards. A mix of quality materials were used including brick, wood and tiles. From the wooden beams and the beautiful stone flooring, all of the elements come together to create a pretty country house that can suit any neighborhood in the Philippines. Embracing homey comfort, this kitchen has plenty of equipment on display and within reach – definitely not a minimalist residence. However, the careful arrangement keeps it from appearing cluttered and the windows allow ample natural light to brighten up the room. This modern rustic kitchen comes to life out of an old demolished barn. Much of the wood used in the furniture here was salvaged from this barn. It’s a sustainable and eco-friendly design that is perfect for homeowners who want a room that’s fresh, affordable and not wasteful. New equipment are built into the room to include some modernity into the space. This kitchen is as stylish as a vacation home. With high ceilings, brightly-hued walls and furniture, natural light, and wooden touches all throughout, the room feels like the perfect fit to a tropical residence. Tiny indoor plants bring nature inside as well as adds a touch of color into the living space. Its rustic sensibilities make itself known in the liberal use of wood, but the minimalism of the furnishings and décor are quite modern. Neutral colors set the stage for a rural-style space in this open layout. Different shades of browns maintain continuity within the space while keeping the visuals interesting and dynamic. The design of each individual piece – the cabinets, the tables and chairs – are quite modern, but the décor tell a different story. After all, the charm of this modern rustic kitchen lies in the carefully selected details. Flowers and vines keep the room fresh and nature-inspired, while wicker baskets and wooden furnishings add more country appeal to the home. Can a kitchen be both rustic and industrial? As shown in the featured room, yes it can. In this modern rustic kitchen, we see the best of the industrial style combined with the most interesting rural furnishings. Instead of steel, there is wood throughout. Concrete and exposed brick create a cool yet natural effect. 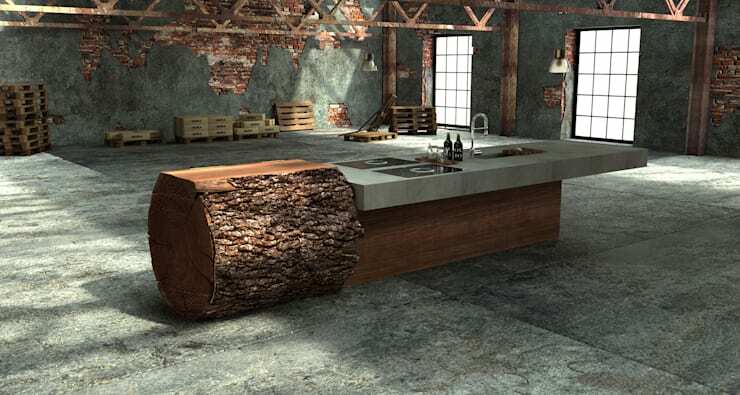 Most strikingly, a tree trunk was transformed not just into a wonderful decorative piece but a central and functional piece of equipment in the room. Sitting atop the trunk is a concrete slab where the sink and cooktop are located. We’re quite used to tile cladding in the kitchen; tiles are easy to install and maintain. However, another option that may be more suited to your aesthetic is simply painting the walls. With infinite hues to choose from, it gives you more flexibility in the design of your kitchen. Besides, modern types of paint are just as easy to maintain nowadays. Having trouble choosing a color? 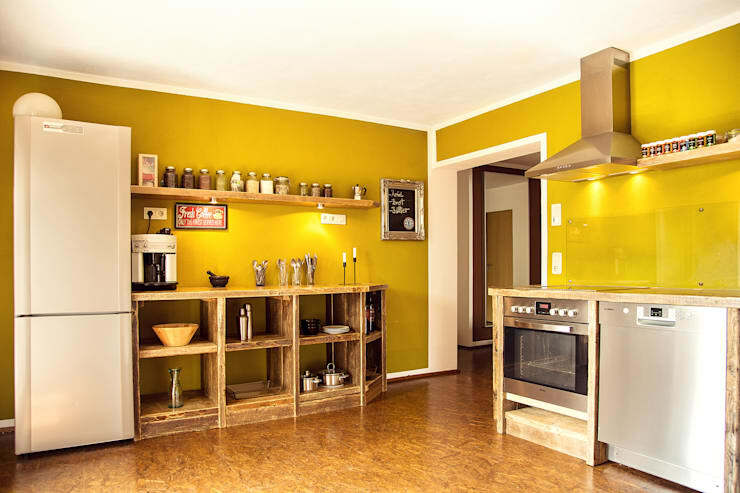 Try mustard, as seen in the featured kitchen. It complements the color of wood very well, plus creates an eye-catching backdrop for the room that is – more often than not – the heart of the residence. It’s not just paint that can bring eye-popping color into a room. 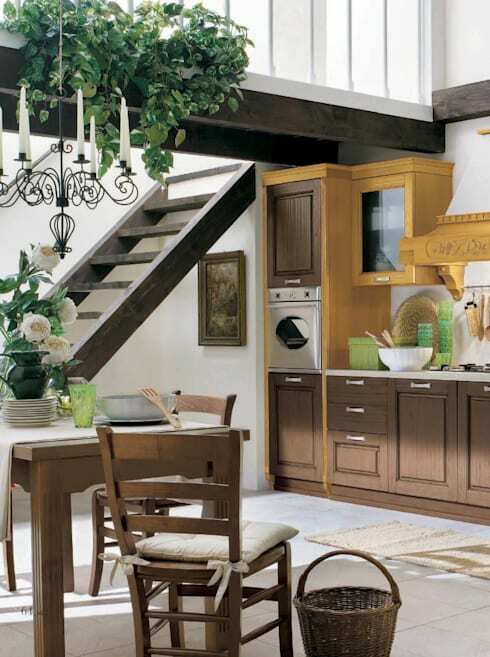 In this kitchen, the light wooden furniture combine beautifully with the green appliances. 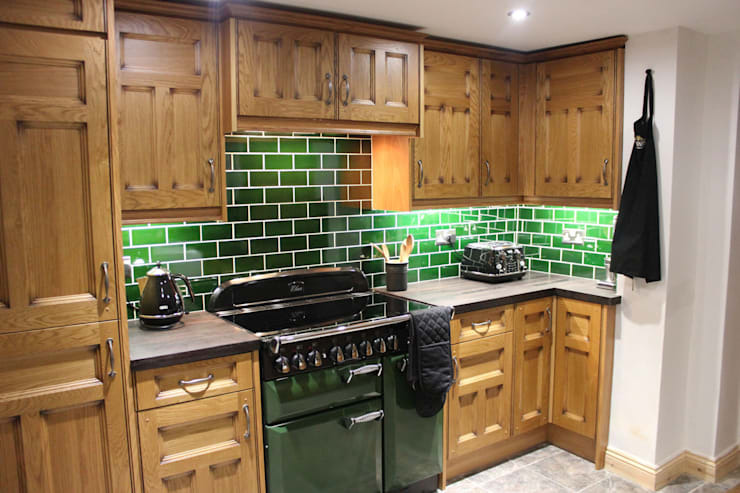 The vivid green splashback tiles are even brighter, adding vibrancy to an otherwise plain rustic kitchen. For a more modern look, choose rectangular brick-like tiles instead of squares. Finally, here’s a kitchen that features more authentic flair than many modern rustic kitchens. It’s not glitzy at all, but it has natural charm that comes from well-curated decorative pieces such as wine bottles hanging as light fixtures from the ceiling, a wall that can be written on with chalk for reminders or recipes, rough yet elegant brick walls, and more. Natural materials are used throughout, including a sturdy wooden table. A simple white cloth keeps the clutter under the sink out of sight. In this kitchen, originality and creativity rules. If you’re starting from scratch, you might want to check out the 6 best kitchen layouts for Filipino homes.